Sorry, Darling! 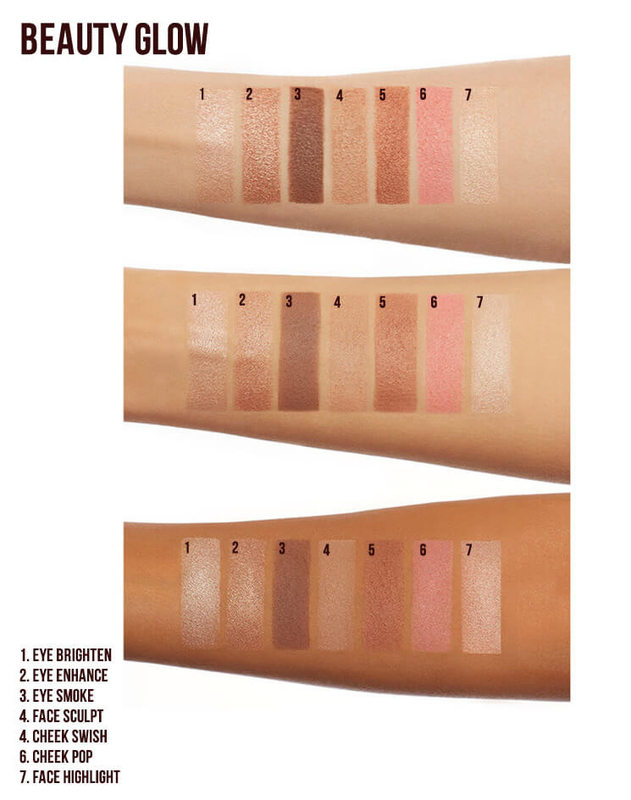 The Instant Look In A Palette Beauty Glow is now SOLD OUT. Can't live without it? Charlotte recommends Instant Look in a Palette Smokey Eye Beauty. Darlings, my Instant Look In A Palette in Beauty Glow has all you need to get that healthy, glowing look that is flattering for EVERYONE. 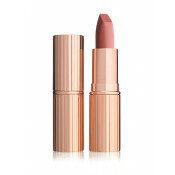 The rose-gold and bronze tones will create the most magical version of you! 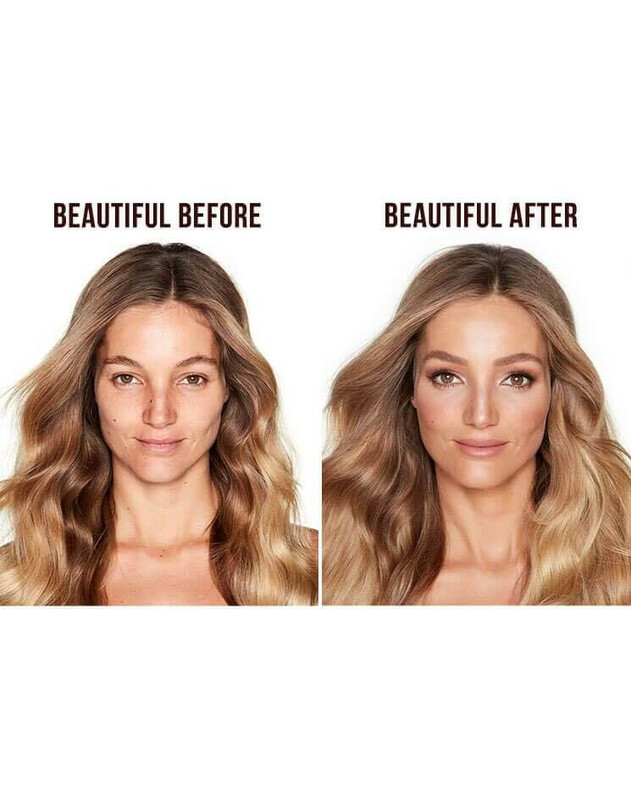 • Get an instantly GLOWING, gorgeous makeup look in 5 minutes! 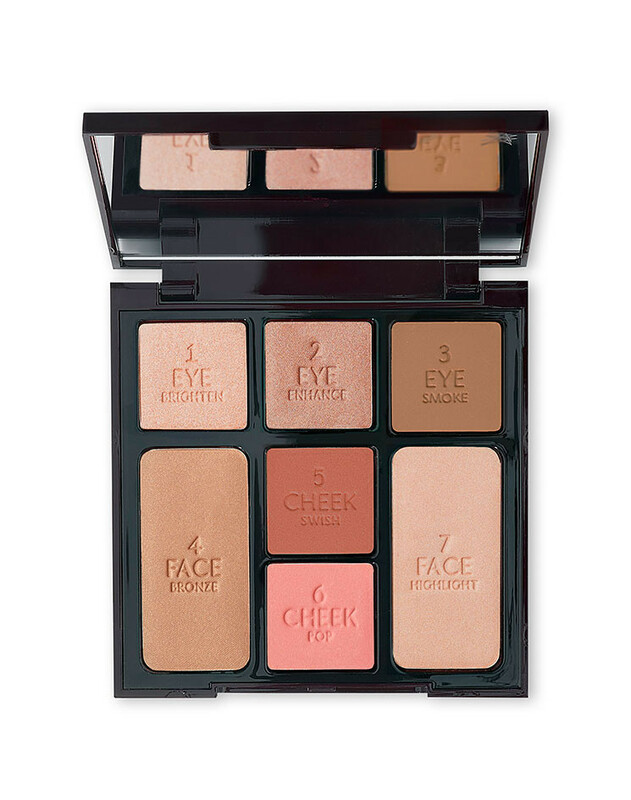 • This makeup palette is easy to use, whether you are a complete beginner or makeup pro! • Inspired by Poppy Delevingne’s wedding makeup, this palette is full of rose-gold, bronze tones for dreamy, ethereal perfection, whether you are a blushing bride or wedding guest! • HD ready formulas mean you look gorgeous and glowing in photographs as well as real-life! • Ideal if you want flattering, bronzed, radiant makeup that is perfect for any occasion. 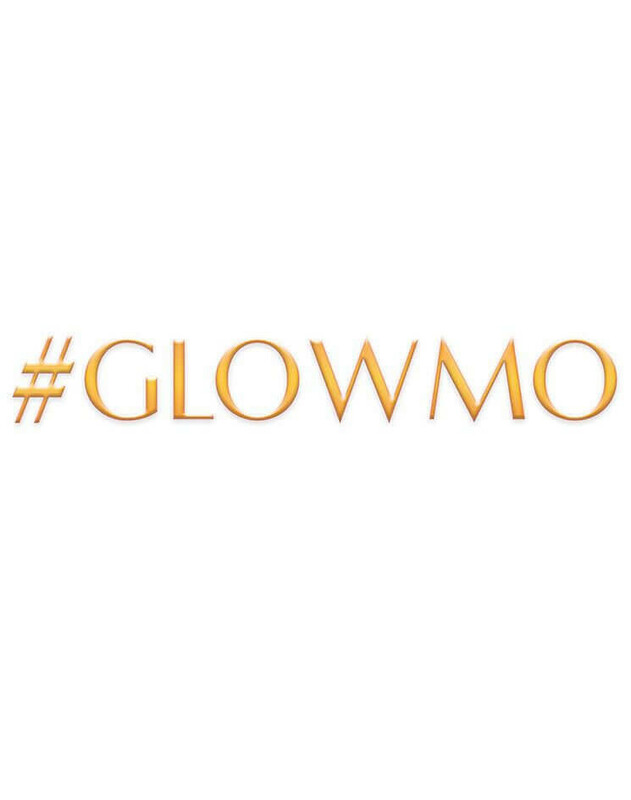 Find out more about #GLOWMO and how you can create your glow moment. 1. To use, start by applying the Eye Brighten shade all over the surface of the eyelid for all-day application using the Eye Blender Brush. Then use the Eye Enhance shade across the upper crease. 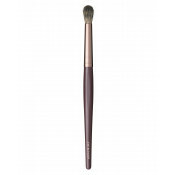 Then using the Eye Smudger Brush , take the Eye Smoke shade and brush along the upper lash line and a little underneath for added intensity. 2. 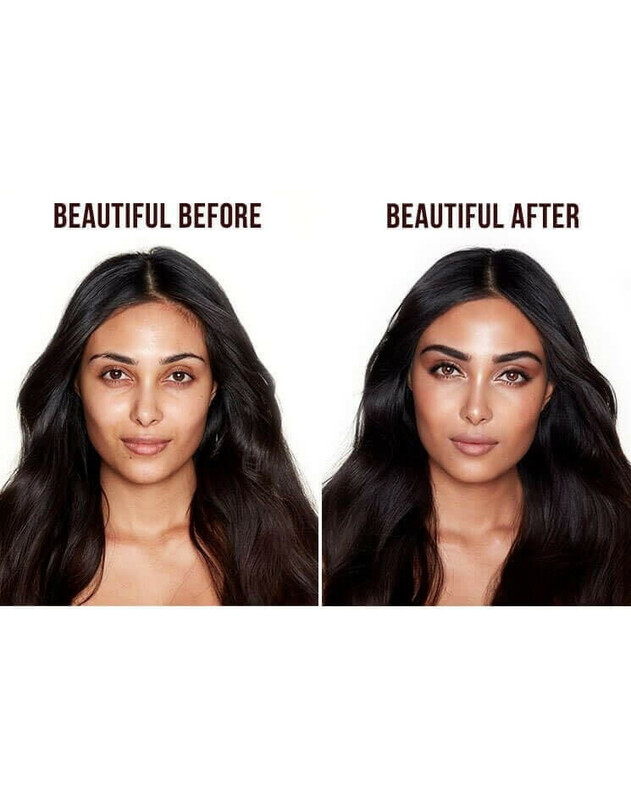 Use the Bronzer brush to dust the Face Bronze shade, from my best-selling Filmstar Bronze & Glow formula (Light to Medium shade), where the sun would naturally hit your face for a dreamy glow. Then use the Face Highlight shade on top of the cheekbones and down the t-size and cupid’s bow for a dripping in a candlelight effect. 3. Swish the Cheek Swish up your cheeks in circular motions for an instantly healthy glow. Then pop the Cheek Pop shade on the apples of your cheeks for that gorgeous flushed look. 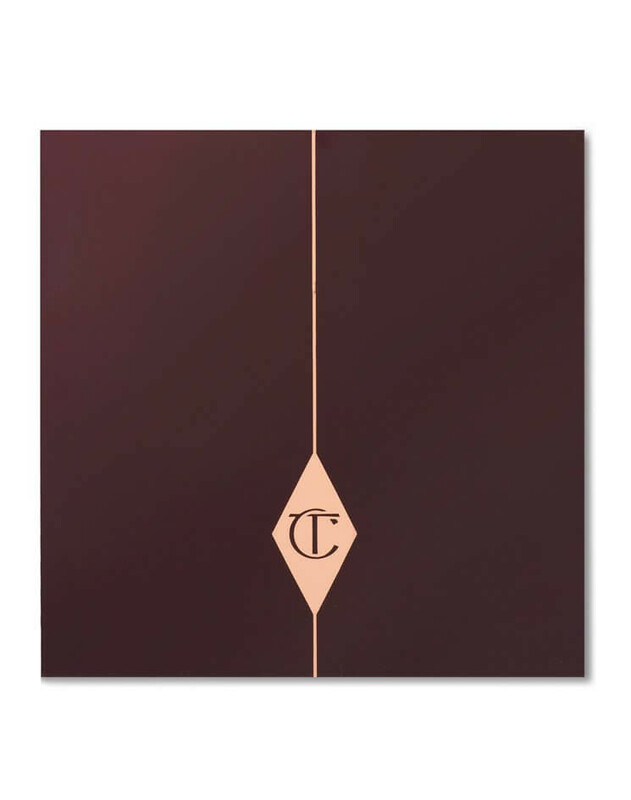 • Charlotte’s Tip: Use this makeup palette along with Charlotte’s Magic Cream moisturizer to create a flawless base for your makeup. This product is paraben-free, sulfate-free, and not tested on animals. 1. Eye Brighten and Eye Enhance: Talc, Mica, Dimethicone, Octyldodecyl Stearoyl Stearate, Zinc Stearate, Zea Mays (Corn) Starch, Silica, Pentaerythrityl Tetraisostearate, Potassium Sorbate, Chlorphenesin, Tetrasodium Edta, Calcium Aluminum Borosilicate, Tin Oxide, [May Contain/Peut Contenir (+/-): Titanium Dioxide (Ci 77891), Iron Oxides (Ci 77491, Ci 77492, Ci 77499), Ultramarines (Ci 77007), Carmine (Ci 75470)]. 3. Eye Smoke: Talc, Zinc Stearate, Silica, Polyethylene, Isononyl Isononanoate, Zea Mays (Corn) Starch, Mica, Dimethicone, Caprylyl Methicone, Zeolite, Methylparaben, Sorbic Acid, Dimethiconol, Tetrasodium Edta, Propylparaben, Butylparaben, Bht, Trimethylsiloxysilicate, Iron Oxides (Ci 77491, Ci 77492, Ci 77499), Ultramarines (Ci 77007). 4. Face Bronzer: Talc, Mica, Oryza Sativa (Rice) Starch, Isononyl Isononanoate, Dimethicone, Zea Mays (Corn) Starch, Zinc Stearate, Caprylyl Glycol, Octyldodecyl Stearoyl Stearate, Phenoxyethanol, Dimethiconol, Hexylene Glycol, Polymethylsilsesquioxane, Silica, Trimethylsiloxysilicate, Tin Oxide, Iron Oxides (Ci 77491, Ci 77492, Ci 77499), Titanium Dioxide (Ci 77891). 5. Cheek Swish and 6. Cheek Pop: Talc, Mica, Isononyl Isononanoate, Oryza Sativa (Rice) Starch, Dimethicone, Zea Mays (Corn) Starch, Zinc Stearate, Caprylyl Glycol, Phenoxyethanol, Dimethiconol, Hexylene Glycol, Octyldodecyl Stearoyl Stearate, Polymethylsilsesquioxane, Silica, Trimethylsiloxysilicate, Tin Oxide, [May Contain/Peut Contenir (+/-): Titanium Dioxide (Ci 77891), Iron Oxides (Ci 77491, Ci 77492, Ci 77499), Red 7 Lake (Ci 15850), Yellow 5 Lake (Ci 19140), Red 6 (Ci 15850), Carmine (Ci 75470)]. 7. 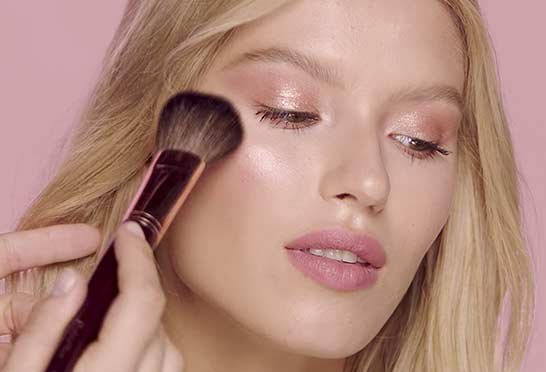 Face Highlighter: Talc, Mica, Isononyl Isononanoate, Oryza Sativa (Rice) Starch, Dimethicone, Zea Mays (Corn) Starch, Zinc Stearate, Caprylyl Glycol, Phenoxyethanol, Dimethiconol, Hexylene Glycol, Polymethylsilsesquioxane, Silica, Trimethylsiloxysilicate, Tin Oxide, Titanium Dioxide (Ci 77891), Iron Oxides (Ci 77491, Ci 77492, Ci 77499).